Mychelle DeWoolfson grew up riding in Western Pennsylvania. She trained through grand prix dressage, as well as jumpers and hunters. 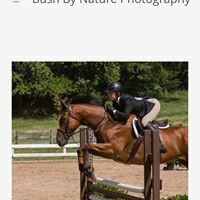 She has successfully shown hunters and jumpers throughout the U.S. Her riders and horses have received State, Zone and National awards. 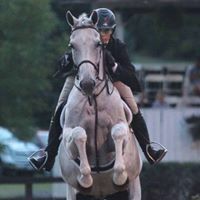 Mychelle DeWoolfson has trained horses for the hunter and jumper ring for over 35 years. Each horse is given an individual training program and consistently worked to change behavior and build correct muscles so they can achieve their owner's goals. Owners can also participate in lessons and training of their horses. 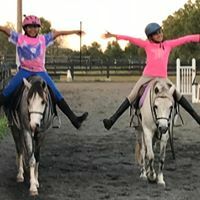 Lessons are taught on our experienced horses and ponies or yours. We also have a number of horses and ponies available for lease and sale. Camps are taught in a group lesson format. Campers learn all aspects of horsemanship including care, feeding, grooming and show preparation. Campers take at least one lesson each day and may also participate in trail rides or shows. I am committed to helping each rider do their best with the horse they have. Decide on the program best suited for you and your horse. Take an evaluation lesson and talk about you and your horse's needs and goals. Mychelle will come up with an individual program for you both.